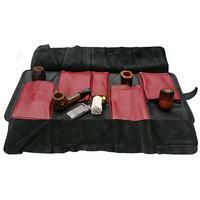 In the world of fine leather pipe accessories, there a few who can compete with Claudio Alberi. Well thought-out design, smart looks, soft, beautiful Italian leather, and simply excellent workmanship come together to create these pieces. Here we find a newer roll-up offering, featuring all the same practical pluses of the older model — four soft pipe pockets, a smaller one for accessories and pipe cleaners, supple flaps to keep your pipes out of contact with each other when rolled up, and a strong and attractive brass and leather belt to keep the whole thing closed securely. The main alteration is at the exterior: whereas previous models used thicker, stiffer leather for the outside and softer leather for the inside, this one keeps both sides supple, while adding a contrasting fastening loop along the buckle, matched in color by the interior's various pouches. 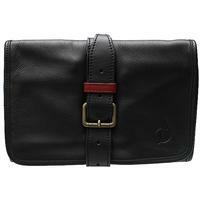 This particular model is available in an all-black leather finish, with a red leather fastening loop to accent on the exterior, matched by red leather for the interior pouches.